Cupcakes are great for those times when you want something sweet for dessert without having to take up too much time in the kitchen. Kids birthday parties, school bake sales, workplace related events, among other things, can benefit from having cupcakes for dessert. 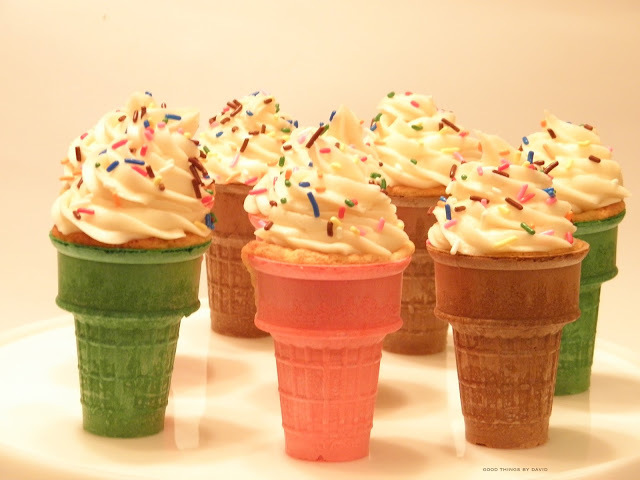 Recently I was asked to make some cupcakes for a few individuals in town, and because of the warm weather we were experiencing at the time, I decided to bake the little cakes in ice cream cone cups. Have you ever baked cupcakes in ice cream cone cups? 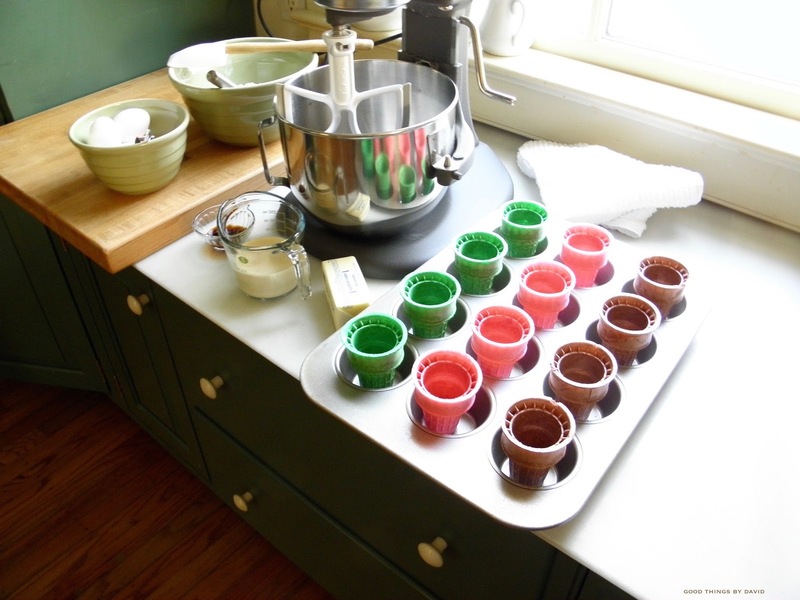 You should because it's very easy, and because it delivers an unexpected surprise when you set them out for guests. Whether you set out a dozen of them on a great cake stand or you package them up in cellophane bags for a bake sale or for gift giving, I think it's a good idea to make them as colorful as possible. Remember, they should be just as enticing as an ice cream cone topped with sprinkles. What I did was make one batch of my vanilla cupcake batter, and then place the flat-bottom ice cream cones into a standard muffin pan. You'll see certain websites advise you to pack crumpled up foil wrap around the bases of the ice cream cones to keep them from tipping over, but if you're careful when filling the cups with batter, and when you transfer them to the oven, you should be fine leaving them as is. Simply transfer them to the oven with great care. 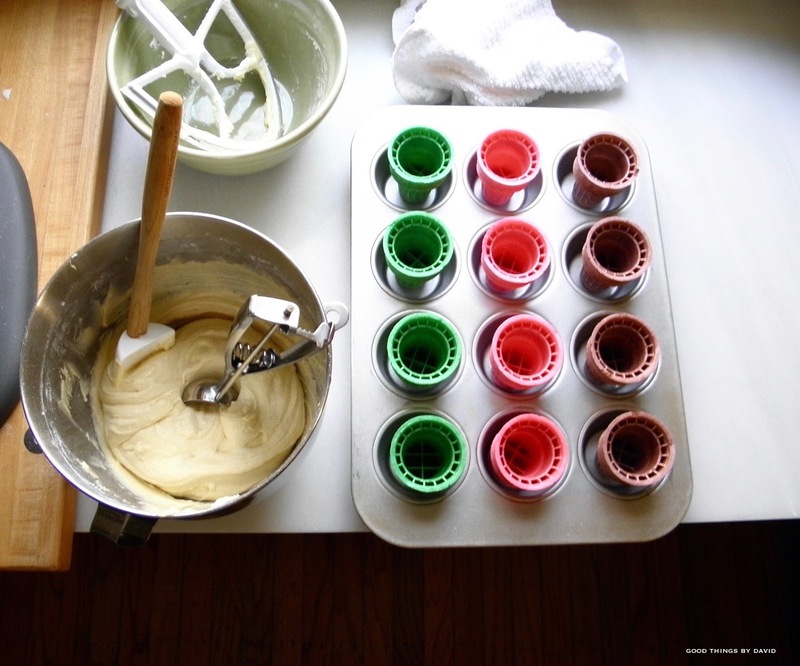 One thing I will say about making these cupcakes is to be careful not to fill the cups more than halfway with cupcake batter. This should be no more than 2 tablespoons of batter per ice cream cone cup. Bake at 350F for approximately 20 minutes (the same as a standard cupcake). Piping the frostings onto the tops of the ice cream cone cupcakes can be done with either a plain round piping tip, an open star piping tip or even a closed star piping tip. If you want to experiment with other pastry tips, by all means do. If you're making these for a kid's birthday party, I highly recommend having a bar set up with colored sprinkles, hot fudge, maraschino cherries, chopped cookies and various candies so that the guests can custom make their own cupcakes. Don't be surprised if you catch the adults making their own too! 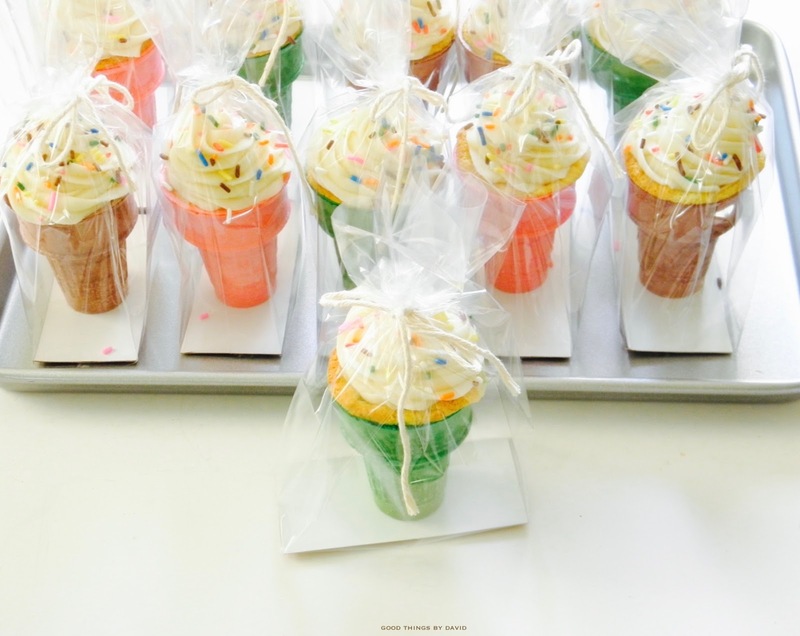 For a bake sale or to give out as gifts to coworkers, use the simple vanilla buttercream (recipe above) which will harden as soon as you refrigerate the cupcakes, and then place the decorated cupcakes into gusseted cellophane bags. 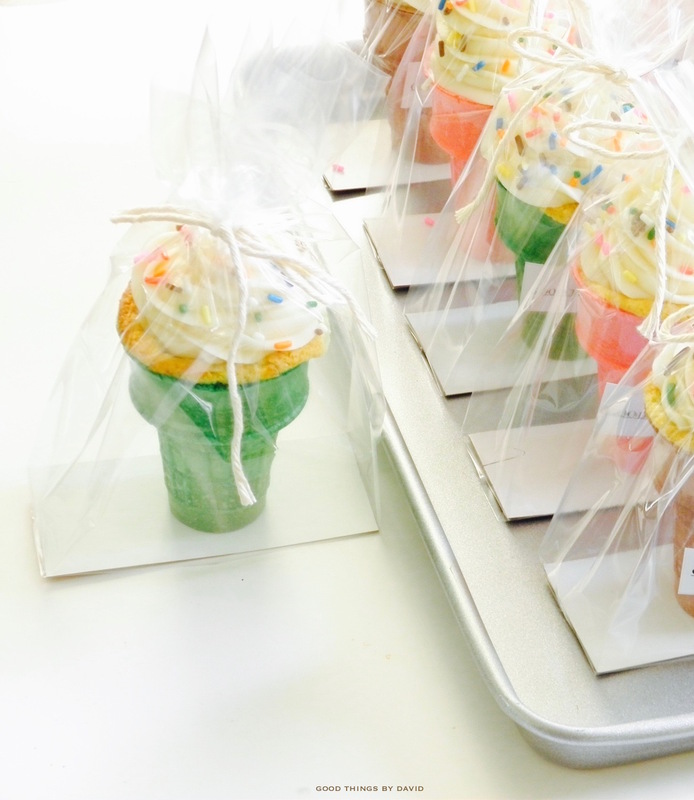 It helps tremendously to place rectangles of cardstock on the bottom of each bag so that the cupcake stands up without tipping over. Tie with baker's twine and you're done! 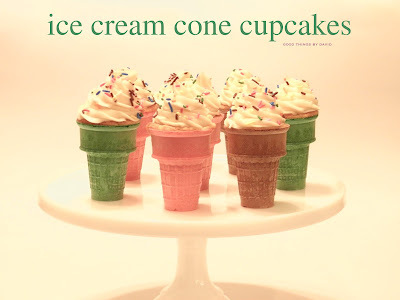 Make some ice cream cone cupcakes as soon as you feel the warm weather approaching, or plan your next party with some in mind. 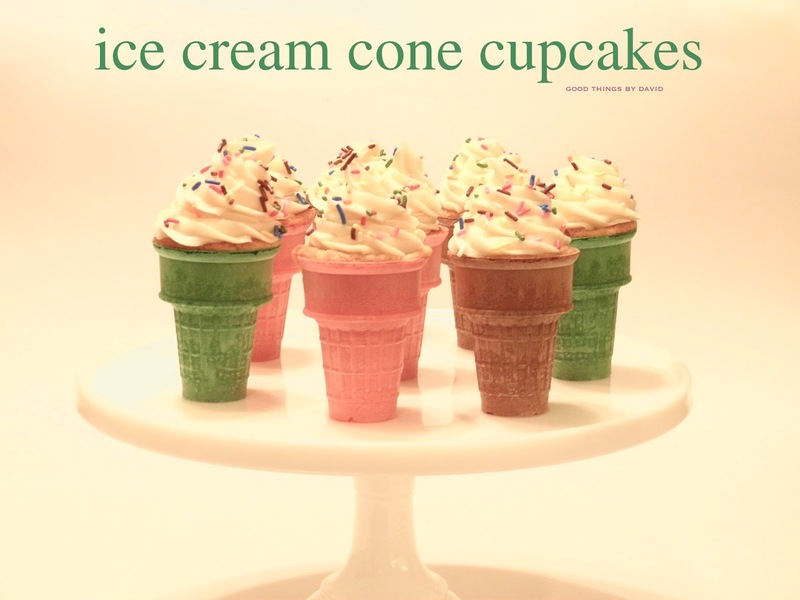 Nothing is easier to make than sweet cupcakes disguised as ice cream cones. Have fun making them!